It has been an amazing 2 1/2 years for me in the Office of Continuous Improvement. Throughout my time as a Student Process Improvement Coordinator (PIC) I have had so many opportunities that I never would’ve imagined for myself as a college student. I can say, without a doubt, that I would not be where I am now without the knowledge and experience that I’ve gained from this position. I can’t thank my co-workers, supervisors and peers enough for their support throughout the years. I came into this position with very little knowledge of any specific Lean tools or methodologies, however, before this job I had mapped processes, organized work spaces, and analyzed root causes. So shortly after starting my training I realized that continuous improvement had always been a part of my life. When I came to this realization, I began feeling much more comfortable in my role, knowing that Lean wasn’t some revolutionary new idea; but simply a set of concepts that draw on a person’s natural tendency toward improving their quality of life. From there, it became very easy to understand and then apply those concepts to processes all over the university. Since starting in January 2014, I have facilitated 3 Kaizens, acted as the team leader for 2 efforts, and have coordinated 22 improvement events across 12 departments on campus. I have thoroughly enjoyed the opportunities I’ve had to work with everyone from Dining Services to Human Resources to the Van Pelt and Opie Library and every department in between. I will be starting my career with General Mills as a Global Sourcing Buyer and will look to carry my knowledge and experiences with Lean and continuous improvement and apply them in this new role. I will undoubtedly miss Michigan Tech and the Office of Continuous Improvement. As Lean practitioners we understand that metrics and data collection are pivotal to the success of any implementation initiative. However, sometimes we forget the benefits of putting these numbers on display for all to see; this group did not. 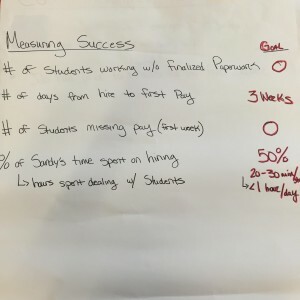 We decided at the end of the day to put all of our success metrics with their respective goals and deadlines on a flip chart for each member of the team to display in their office. The motive behind this was to ensure that every day, with every decision they make, they are focused on reaching these goals. I thought this was a fantastic idea and one that should be used in all of our projects in the future. A big part of Lean is engagement. Setting clear goals and expectations is a big factor in increasing employee engagement. When everyone is united and working toward a common goal, the opportunities for improvement are endless. This summer I had the great fortune of being a mechanical engineering intern at Massachusetts Institute of Technology (MIT) Lincoln Laboratory. 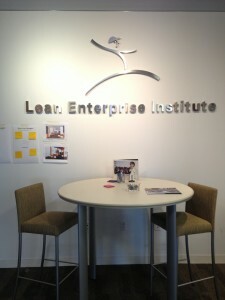 While in Cambridge, John O’Donnall, Executive Director of the Lean Enterprise Institute (LEI), was kind enough to reach out to me and invite me to visit the office. Mr. O’Donnall and I had the chance to meet on campus last year when he was the keynote speaker at the 2015 facilitator graduation. While there it just so happened that they were also having a guest speaker come in and talk about Lean in the civil engineering world and how much waste happens at construction sites because the main currency is the amount of time it takes to complete a project. Although I had to leave before the whole event was over I found her talk to be very interesting. It really opened my eyes to the need to integrate Lean practices into the civil engineering world the way mechanical engineering has integrated it into manufacturing. 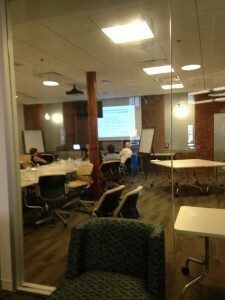 Below is a picture of the talk from an outside view. I also got to meet with James P. Womack the founder of the LEI, as well as some of the M.B.A. summer interns who were in the office. Every summer the office hired a few M.B.A. students from the area to work with them and learn in an immersive experience about Lean principles. John O’Donnell and I mused about the possibility of bringing in Michigan Tech M.B.A. students on as summer interns and I think that it could be a mutually beneficial experience for both parties. 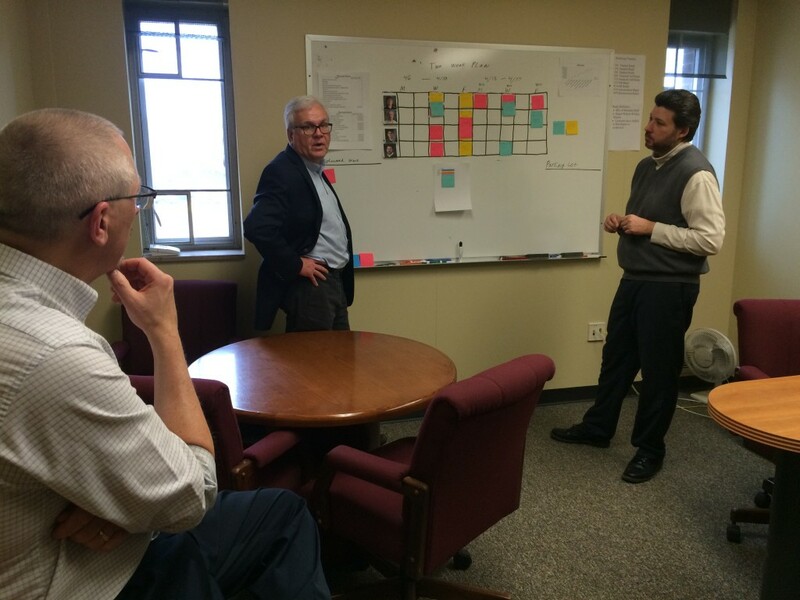 Before leaving John showed me around the office and I was pleasantly surprised with how much our own Office of Continuous Improvement here at Michigan Tech resembled the Lean Enterprise Institute. 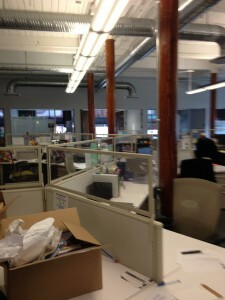 A picture of their office can be seen below. I had a great experience there meeting up with Mr. O’Donnell, Mr. Womack, and meet some of their M.B.A. summer interns. With these guidelines in mind the team was able to create a process map that included each department/area that the process touches and all of the process steps from start to finish (see image below). With the initial map created the team was then able to move forward in creating an “ideal state” process map. The ideal state captures the process in a perfect world with all the necessary resources available. The team was able to look back at the current state map to compare steps and people involved with the ideal state map. The team will continue to work on their ideal state in the next few weeks and then form a plan to move from current to the ideal. Check back to see the final results in a future post. 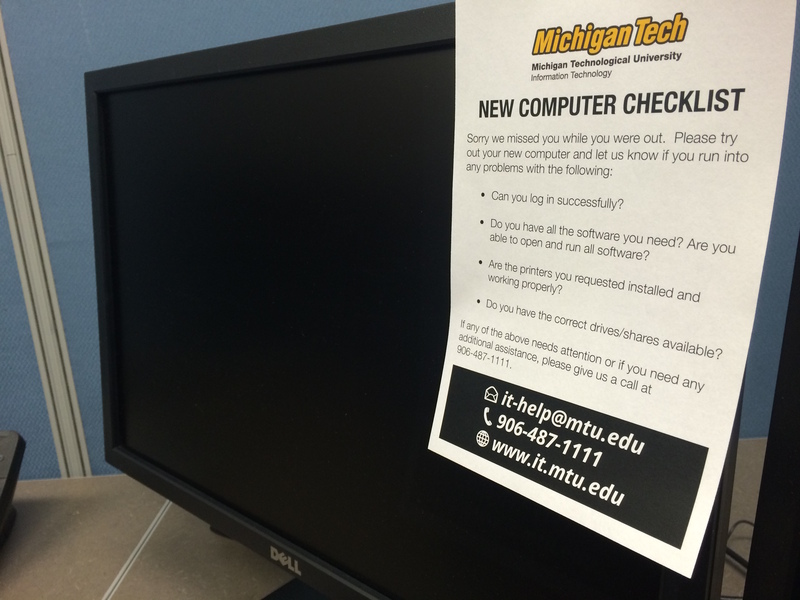 This post was originally published in Michigan Tech’s IT News and Announcements blog. Lean principles are generally well established and have been applied to manufacturing for quite some time. The idea is simple: identify and eliminate areas of waste that lead to poor service for customers. Within Michigan Tech IT, we’ve begun to apply those principles to our work. Though the changes are small, they’ve made a large impact in how we do daily business, and they’re sparking a cultural change within our organization. The Services Team is using daily Group-up meetings to increase awareness among staff and solve problems. “Our morning huddle brings everyone together for 15 minutes to discuss what is most important, most time-sensitive, and most technically problematic,” says David Kent, IT Services Director. One of the main objectives of the meetings is to help each other solve problems or help with time-sensitive commitments. “Threats to projects and deadlines are identified quickly, and often resolved on the spot, because the entire team is present,” says Kent. For the past month, the Enterprise Application Services group has been using a Cadence Board for their Web Focus Project. The low-tech and flexible visualization tool gives visibility to the current workflow and progress and informs the team of each other’s work progress. The board displays planned work, unplanned work, high level milestones, a parking lot (for future items) and a rolling two-week work plan. The team meets three times a week for status updates and discussion. One of the deliverables produced as a result of process mapping: a computer checklist which now accompanies each new deployment. A warm welcome to our new guest blogger, Jim Desrochers. Jim is the Associate Director for Employer Relations in Michigan Tech’s Career Services. He is also training to become a campus Lean Facilitator. In a manufacturing setting, waste is measured in terms of factory efficiency and scored by the accounting measurement system as part of the financial reporting process. In an office setting, these measurements are harder to define but they “show up” in wasted effort, frustration, frayed nerves, and people staying late to help make the event a success. Our Career Services group is known for coordinating our bi-annual Career Fairs. Managing logistics for hundreds of companies, nearly a thousand recruiters, and several thousand students leaves very little room for error. Most importantly, the future careers of our students are on the line. With the economy improving and the excellent reputation of Michigan Tech students, the size and expectations for Career Services events have continued to grow. As our department’s first step in our lean journey, we decided to start a morning huddle. 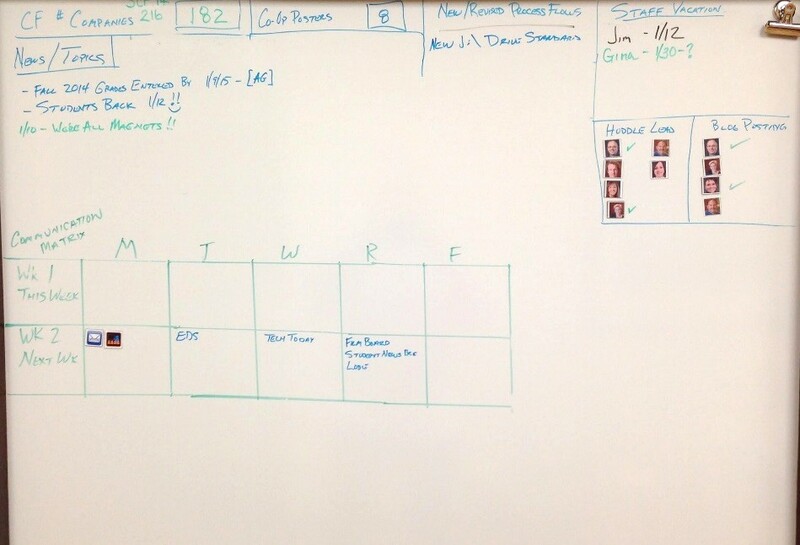 Initially, the primary focus of the meeting was our event-planning calendar. 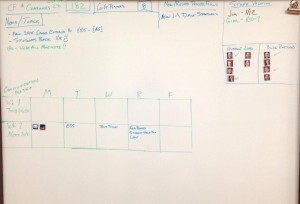 This grid is a look ahead for the next few weeks to ensure everyone in the department knows what is coming next. To make this happen, we repurposed a dry erase board and moved it to a central area. A few dry-erase markers later, we had the beginnings of a communication structure! In an office where everyone is extremely busy, we had reservations about everyone sacrificing 10 minutes of their day. We also were concerned that we would not know what to talk about! These concerns turned out to be unfounded! 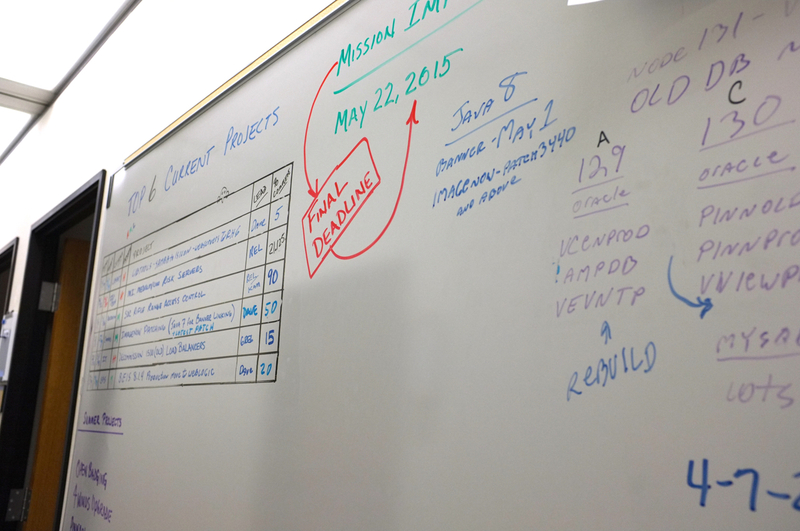 After a month of using this new process, the information on the dry erase board has changed. Some things we initially placed on the board aren’t used anymore and we simply erased them. New items are added as we develop new educational programming. Using only markers and bad penmanship, the board continues to be dynamic. We are starting to use rulers and magnets to make the look neater – but we don’t want to lose the flexibility of just getting the information communicated. Our implementation of Lean Initiatives in our offices continues as time allows. As we continue to add process improvements, these items will find their way back to the central huddle board. It will be interesting to see what the board looks like a year from now! Most people practicing Lean know 5S–Sort, Set, Shine, Standardize and Sustain–and they know it can be applied to many things. Here at Michigan Tech we have applied this thinking to shared network storage spaces. I have now facilitated 4 of these events. At the first one I facilitated, I obediently followed what I was taught and started with Sort. We went through all the files and worked on deleting the garbage. For Set, we worked on putting the remaining files into a logical order and making things easier to find. Shine involved going back through the files (again) and renaming them consistently. When we came to the Standardize step it basically turned into documenting what we had spent a lot of time doing–what should be kept, for how long, where to store things, and naming conventions. Finally, the Sustain phase, including setting up regular audit schedules and procedures for making sure the drive stayed neat and organized. In the end we did leave with a well-organized, easier to navigate shared drive, but the process itself was frustrating and extremely long. The team spent an inordinate amount of time during the Sort and Set phases strongly “discussing” whether a specific file should be kept or deleted and what folder it should be in. We also did think of metrics, kind of. We looked at the overall size of the share and, in the end, did make it smaller. But if you are only measuring the size of the share and your goal is to minimize it, then the simple answer to achieve perfection of that measurement is to just delete everything and use zero GB, right? Around that time, I read an article, “5S Shakeup” by John Casey on the Quality Progress website, and had a revelation–perhaps we should be starting with the 4th S instead. On my next network drive 5S event I was able to try this out. We started by creating the standards document. I began this discussion off with one simple question–what is the purpose of this drive? We talked in general about what should be kept at all, how long to keep files, and how to name them. This completely focused the whole event and eliminated the extended discussions on specific items. The Sort, Set, and Shine could all be done in one pass through because the rules were already defined, and these steps were split up and done as homework instead of in a big group. The individuals returned to the next meeting with just a few files they were uncertain about, and the group made decisions on their disposition together. I also worked on the metrics. At the pre-meeting with the team leader, we dug more into why they wanted to attack this problem. This helped to identify various metrics that would actually measure what they needed them to. If the why was because new staff can’t find things easily, we did several before and after time tests to see how long it took to find various files. If the problem involved just too much stuff, we still looked at the overall size, keeping in mind that zero is not really the goal, but more like reduce and then maintain that reduced size. We looked at the number of root folders, total number of folders and total number of files. This event went much smoother, and I heard a lot of comments from the team members that they really enjoyed the experience. 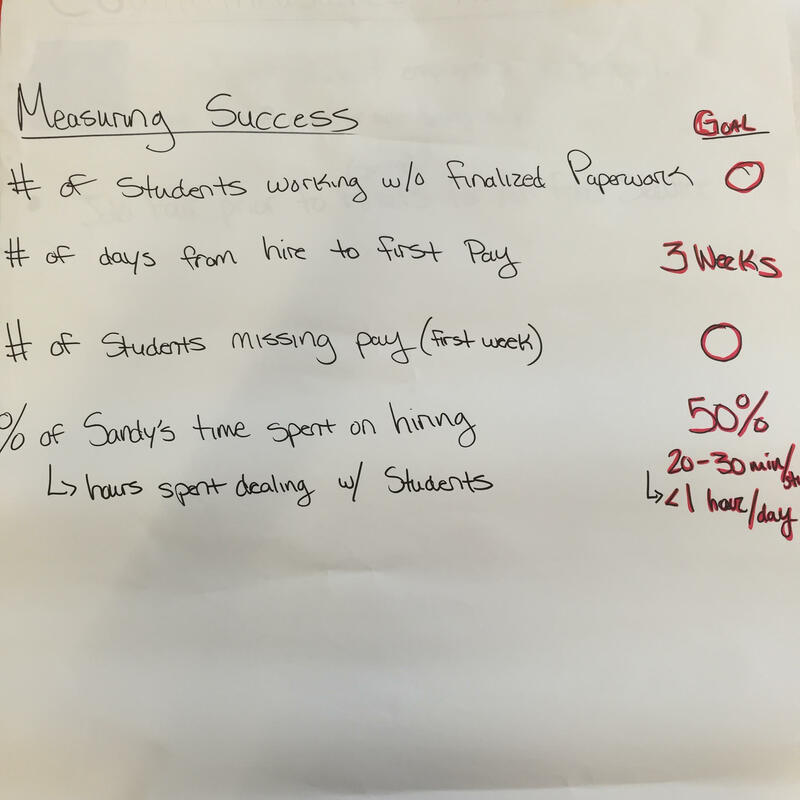 When another campus facilitator was slated to do one of these events she asked me for some tips as she knew I had done a few, so that prompted me to write some Best Practices, which I have made available here: Network Drive 5S Best Practices January 2014. Thank you to our returning guest blogger Mary Fogelsinger-Huss for another excellent article on how Lean is used in industry. Mary is an ASQ Certified Six Sigma Black Belt working for the Dow Corning Corporation in Midland Michigan. She has nearly 30 years experience in the chemical industry, with nearly half that time involved in quality practices for various product lines in the company. She holds a bachelors in Chemical Engineering from Michigan Technological University. 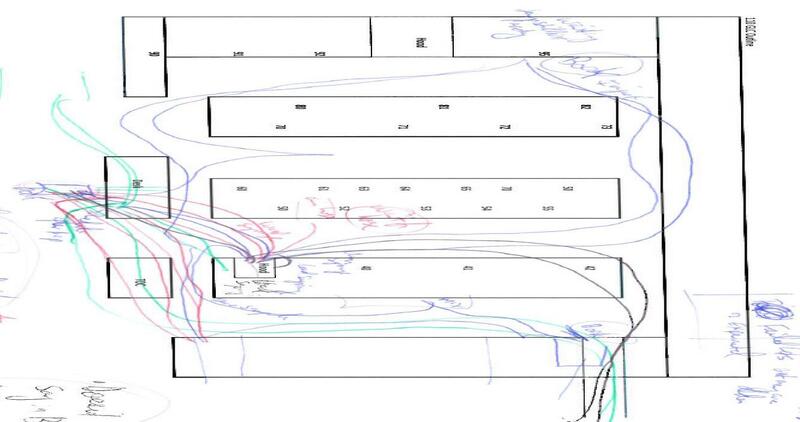 The different lines represent the number of trips a person took in performing a test. The background is the layout of the lab, with the test equipment noted by numbers (or dots in this poor image). This shows that the operator performing the test walks back and forth quite a bit between the different pieces of equipment. Depending on your goal, this could be good or bad…good for exercise, bad for productivity! The project team recognized the “waste of motion” in the process, using the spaghetti diagram, and was able to move equipment around to minimize the trips from one bench to the other throughout this test. This change allowed the test to be completed in less time, improving customer relations (production buildings want to know results FAST!) and increasing testers’ productivity. A simple tool, providing impressive results. 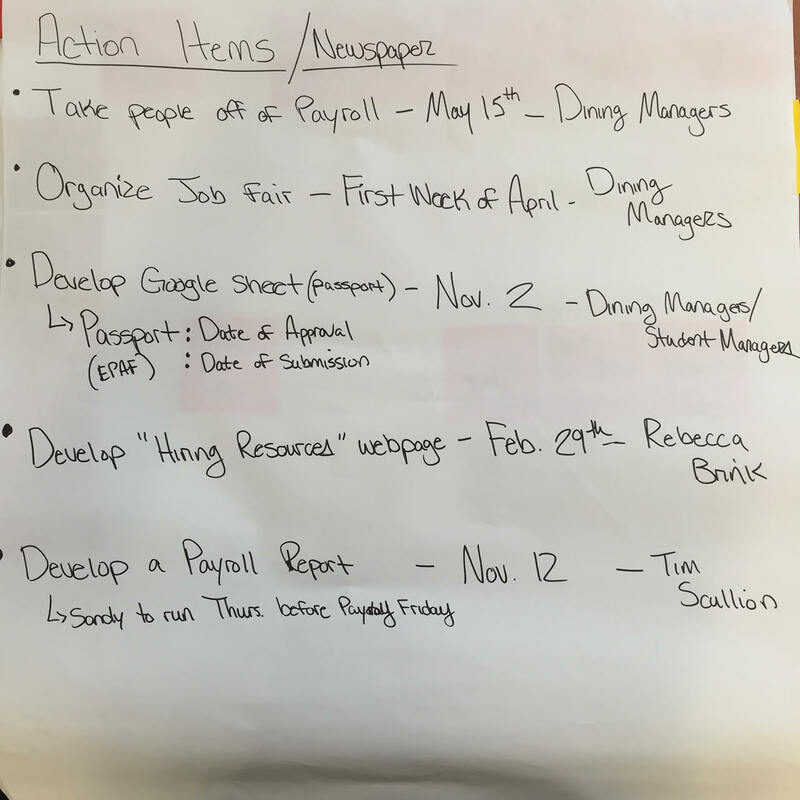 The following guest post was written by Kaylee Betzinger, a former student process improvement coordinator here at Michigan Tech and currently an intern at Amway in their Enterprise Excellence Department. 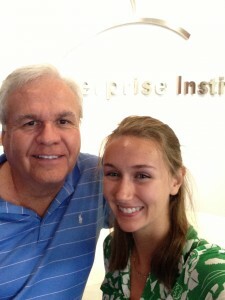 For the past 13 weeks I’ve been interning with Amway in their Enterprise Excellence Department. While in this position I’ve gotten to partner with a variety of cross functional teams throughout the business and within the West Michigan community. One project in particular is a non-profit venture with Mel Trotter Ministries. Mel Trotter Ministries exists to demonstrate the compassion of Jesus Christ toward the hungry, homeless and hurting of the greater Grand Rapids area (www.meltrotter.org/mission). They are able to provide a variety of services to these people in need because of their 4 thrift shops located throughout West Michigan. I’ve been working closely with Greg Alvesteffer, Assistance Vice President of Retail, on their donation process. 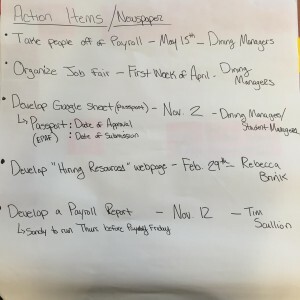 Before I began working with Greg and his team, their donation processes were quite a mess. First and foremost, there was no standard process spanning all of the stores (yikes! ), making it difficult for the store managers and Greg to share ideas with one another. We also found numerous wastes in their process, the biggest being over processing. Multiple employees were touching the same donation multiple different times which was resulting in huge batches (they would create a batch of 50 donated clothing articles, then push them down an “assembly line” for the next employee to work on). While observing at the Gemba, we asked the question “Why do you create these batches?” That got me a variety of answers and a few weird looks, but ultimately the answer was “that’s just how it’s always been,” a typical answer in non-continuous improvement environments. After multiple days observing and a few hundred questions we began to experiment and change things around a bit. My Amway mentor, Steve Sweers, and I explained the value of one-piece flow in what Steve calls the OHIO method (Only Handle It Once). This really seemed to resonate with Greg and the employees we were working with. After a few weeks of experimentation, I did some time study evaluations to compare the old process with our new process and the results were astounding! By eliminating the batching process and installing a one-piece-flow production we were able to decrease space requirements by 70%, reduce labor requirements in that area by 83% (they were able to reallocate several employees to other departments within the store), and ultimately increased productivity by 480% (yes, that is possible!). It’s incredible to know that we were able to get these results without any capital investment. All we needed was to apply some continuous improvement principles in their processes and presto, huge improvements! Being able to share this knowledge with a business like Mel Trotter has been such a rewarding experience. I will be continuing this partnership this fall where we plan to continue to make improvements throughout their retail stores.